L: 85.5" x W: 41" x H: 37"
Kristoff Sofa For fans of comfortable, chic living room furniture, the Kristoff sofa fits the bill. It's full of modern style and flaunts details like a single row of button tufting on the cushions, sloping track arms and freshly fashioned pillows. 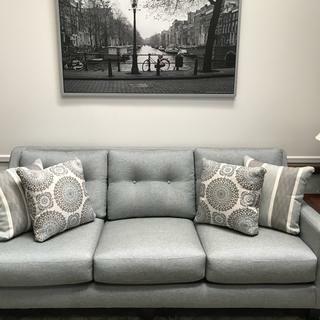 Plus, with its trendy gray upholstery and reversible seat and back cushions, this sofa will look like new for years to come. For fans of comfortable, chic living room furniture, the Kristoff sofa fits the bill. It's full of modern style and flaunts details like a single row of button tufting on the cushions, sloping track arms and freshly fashioned pillows. 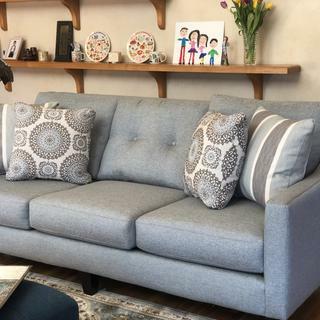 Plus, with its trendy gray upholstery and reversible seat and back cushions, this sofa will look like new for years to come. L: 85.5" x W: 41" x H: 37" Weight: 124 lbs. Inside arm to arm: 76.5"
I was looking for a true grey couch. I questioned the color (advertised as grey) in the showroom, but was told it was just the terrible lighting. I was assured it would be grey, like in the picture when I got it home. I wanted to get a swatch to take home, but was told they didn't have one, so I was convinced to buy it. Now that it is home, it looks totally blue to me and looks horrible with the chairs and rug I have in the room. It is comfortable but I hate the color. This collection was ideal for us. We were looking to get away from the browns and step into the new gray, white, blue arena and this collection did it for us. Perfect!!! So happy. We purchased the entire Kristoff Sofa Set. We are in love. Absolutely a great purchase. Very Comfortable! This sofa brings a hint of color while still being neutral. I love how firm the cushions are. We are happy with our new furniture! 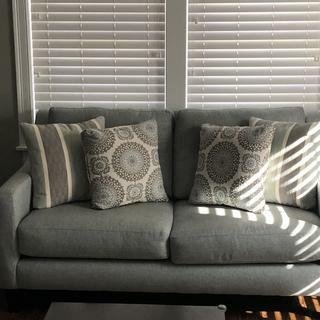 Purchased the soft and loveseat. Love the color of the furniture and the pillows. And, the seats are so comfortable! Highly recommend!! 2 of the cushion buttons fell off the first week after delivery. Fabric stain was cleaned per recommended w-s cleaning code. It is still visible. Its a great buy for our house. Its very comfortable and spacious. I am very happy with my furniture and I also liked the customer service and was pleased with the delivery of my furniture. The care that goes into taking care of the customer, like the furniture, is always something that keeps you coming back and recommending this to family and friends. Super comfortable! So happy this is the choice we made for comfort and it looks great! The new sofa looks great! Sofa is great. Delivery was great. Looks like a high quality piece of furniture. We love our new furniture!! Great quality! Very comfortable . And it is always a pleasure shopping at Raymore and Flanagan’s . I love my new sofa set, they are so gorgeous with a very modern feel to them. The accent pillows are beautiful and best of all the sofas are so comfortable. I would recommend this to any person interested in buying a living set that makes your place feel like a home. They make my living room look elegant! The salesperson was very helpful and patient.i definitely recommend raymour and Flanagan for its attentive help and quality furniture. We love the sofa. We were looking for a firm sofa and this one is firm with and without the pillows. Excellent purchase along with great service. Loved everything- the showroom the consultant and the delivery. All easy! Beautiful sofa! Very comfortable, works well in my space, not too big. Have had many compliments from friends and family. It’s beautiful and well made. Absolutely love the way the couch and loveseat make the room look. The color of this set has such a soothing affect when you walk into the room. The patterns on the pillows are beautiful . Everything goes so well with our tables and window treatments.We even bought a picture that is hanging over our fireplace that goes perfect with everything. This set was right by the door when we walked in.It was exactly what I was looking for. Our whole house is furnished from Raymour & Flanagan’s. Need I say more. Hi Maynard. Isn't it such a great feeling when everything comes together? I'm sure with all the finishing touches, your new room looks absolutely gorgeous! Thank you for your review. Great product, great company! I have been especially pleased with the staff at Raymour & Flanagan, from the sales people to the delivery crew, and everyone I encountered in between. I look forward to shopping there again! Great couch. Color looks different than most Sofas. Great modern look. I am so pleased with the sofa and lift chair that I purchased. The sofa looks absolutely beautiful in my living room and the quality of the two items is out standing. The lift chair accents the sofa perfectly and gives me excellent support!! I would definitely recommend Raymour and Flannigan to family and friends for excellent, quality furniture. ?? I am very pleased with my experience at Raymour & Flanigan. The salespeople were all very helpful, and Cliff was able to help us find exactly what we were looking for. The delivery was prompt, and the furniture looks great in my living room! We are very pleased with our furniture selection. The sofa is extremely comfortable and the color is amazing. We love our new look and look froward to enjoying it. Customer service was extremely helpful and professional. The delivery men went above and beyond when bringing our furniture into our house. They insisted on putting felt pieces on our furniture, so it didn’t scratch our hardwood floor. They ensured the furniture was covered from the rain and even put a small rug down for me. Overall the whole process was exceptional. Looked great in the store - and even better in our home! 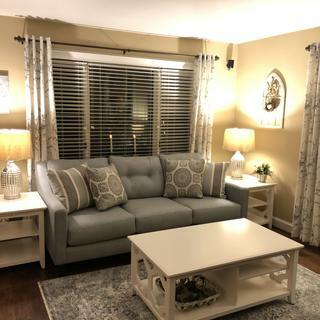 This set looked great in the store, and it looks even better in our living room! Arrived in perfect condition. Very comfortable and stylish - we're very happy! Sofa, Loveseat and Chair are super comfortable and they look great!! Hi Eric, thank you for your review and the photos. The Kristoff looks beautiful in your home. We are glad you are enjoying your new set. This sofa is super comfortable. Deep seating and looks great - love the color. Worth the money. It’s a great color, I would say more light blue. Looks really nice with all the pillows. The sofa is both nice looking and comfy. Looks good in the apartment..
High back and very comfortable. Nicely made and Stylish . When I saw this sofa, I thought it would go well in my living room, but I was a little hesitant about the color. Under the fluorescent lighting, it seemed a little pale. However, when it arrived yesterday, in natural light the color was perfect. It fits beautifully in the allotted space and seems quite comfortable. 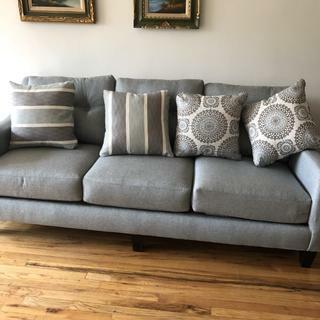 Of course, since I have had it for less than 24 hours, only time will actually tell the story, but as of right now, I am extremely happy with my purchase. .
Nice looking couch if you want green/gray color! Beware of the color! Advertised as gray and does look gray in some lights, including the showroom, but it has a distinct green tinge to it in certain lights. Very disappointed as it did not match at all with our gray/blue walls. Can the feet be changed to a different design? BEST ANSWER: Please contact our online sales department 866.383.4484, option 3 to discuss special order options. 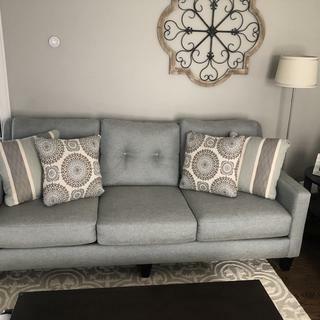 Is this couch gray or is it more of a blue color? BEST ANSWER: It is more towards Blue but I bought a wonderful grey shag area rug which compliments it so well! It’s definitely more of a blue grey leaning more towards the blue end of that spectrum. I am already bored with the neutral colors of the couch and wall. Can you suggest an accent color that would brighten things up? BEST ANSWER: The right end tables and the right lamps for your room will pull the area around your couch together. Or, the right piece of art for the wall above the couch will make the scene, 'pop'. Once you pick the right colors and lamps, you will know it immediately. 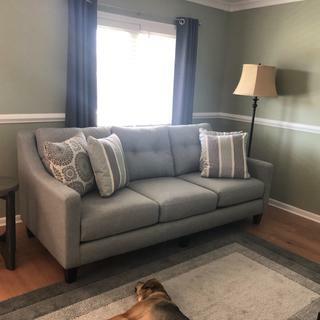 What color wall would accent this couch? I think I will go lighter. It seems to make the couch brighter than with the Indian river. Some natural light, but not much, so I think I’ll go with Smokey taupe or stone hearth. Hello Carolyn! Thank you for your interest in the Kristoff Sofa. Depending on how you would like to decorate and design your room, you may want to choose neutral paint colors such as gray or tan. This will let you change up decor and accent pillows if you choose to do so. I was thinking a taupe/ grey, it seems that’s the background color of the pillows. One I like is Indian river by Benjamin Moore. The room is small, so I’m not sure if that’s to dark. Thoughts? My walls are a pale green but the color of the couch is really rather neutral and I think will look great with most colors. Will the Tatum accent chair in velvet navy or light gray look good with the Kristoff sofa? 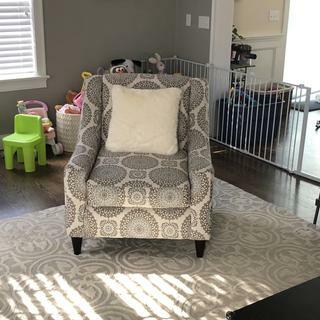 If not, any other suggestions for small accent chairs? BEST ANSWER: Hi Lori, thank you for your interest in the Kristoff sofa. Depending on how you are decorating the rest of the room you may want to go with a neutral chair. The navy would definitely stand out as the darker color within the room unless you had other accent pieces to tie it together. I might recommend the chair attached below as an option. This will also give you the ability to switch around the pillows. Additional pillows can be ordered through your local showroom if you would like an additional accent pillow for the chair. 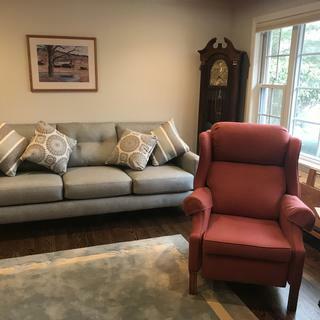 We offer swatches of fabric for the Kristoff as well as the Wimberley accent chair if you would like to see what they look like together prior to purchasing. Unfortunately, we do not offer one currently for the Tatum Accent Chair. Should you want to order a swatch you can do so by clicking "Order Swatch" under the product title on the product page. You are welcome Lori. I know you'll find something you love. The color is great and can easily can pull to incorporate other greys or blues. The sofa is more of a blue gray so I think the navy would look good! I am looking at an end table with a height of 24”. Will that be higher than the arm of the couch? BEST ANSWER: Hello Cathy, tank you for your interest in the Kristoff Sofa! 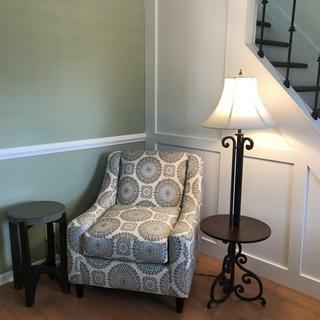 The arm height is 25.5"
is there a matching ottoman availble for this or could one be ordered? BEST ANSWER: Hello Nicole, thank you for your interest in the Kristoff collection! There is not a matching ottoman included, however we offer a variety of ottomans that you can choose from. We would recommend fabric cool colored fabrics such as grays or blues. I saw this on display in Lake Grove in tan and also blue/grey. Why is the tan color not available online? BEST ANSWER: Hello, Joan! Thank you for your inquiry regarding the Kristoff sofa. As it turns out, this particular sofa is currently out of stock, that is why is is showing as unavailable on the website. However, if you are interesting in finding something similar or getting an accurate ETA of when the piece will be back in stock for delivery, we have Home Furnishing Consultants who would be happy to assist you in finding a specific solution. Please contact the online sales department at 866-383-4484 option 3. What is the height of the back without pillows and with the feet removed? I'm worried it won't fit through my 28" wide door! BEST ANSWER: The frame height without the feet and back pillows is 30". It should fit through your door width with no problem with our White Glove delivery service team. Me gustaria saber si los cojines decorativos estan incluidos? BEST ANSWER: Si, los cojines decorativos estan incluidos. BEST ANSWER: The collection name of the coffee and end tables in the room shot images is called, "Evans". The items are attached. We also offer a sofa table.